product. However, as a result of Tajikistan’s mountainous topography, water shortages, and poor irrigation system, only seven percent of Tajikistan’s land surface is arable. These constraints, coupled with a history of conflict have left almost half the population living below the national poverty line, and many women and children undernourished. 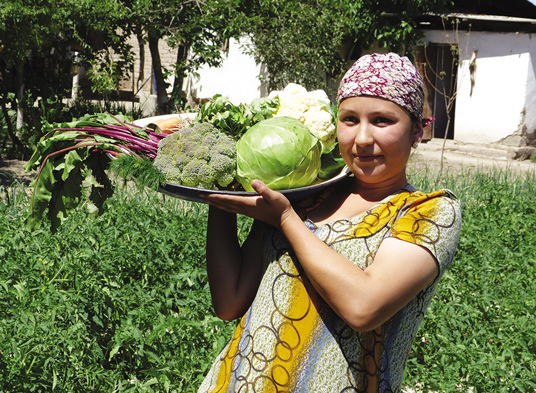 Women undertake 80 percent of the farm work in Tajikistan, often because the men in the family have migrated out of Tajikistan or to a city to gain off-farm employment. These women are organising themselves with more than 4,200 self-directed women’s groups established throughout the country around community and income generating activities. 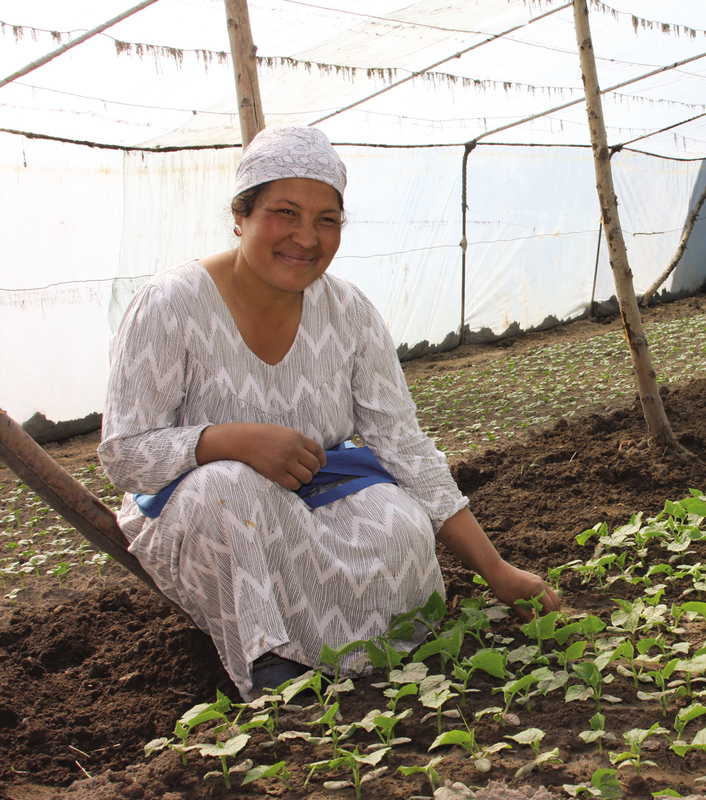 The Government of Tajikistan believes that by giving women equal access to agriculture inputs and training, they can dramatically improve farm output and household nutrition. role women play in this area, many components of the maternal and child health and nutrition programmes in Tajikistan directly and indirectly target women. Moreover, efforts to better understand and address the gender norms that underlie malnutrition are also rising. For example, formative research is planned to explore the barriers to exclusive breastfeeding and optimal infant and young child feeding practices among young mothers who are not empowered to make their own decisions or who do not receive enough support from their husbands and other family members. Early pregnancy leading to a vicious cycle of malnutrition is another area which the Ministry of Health and Social Protection together with development partners have been addressing recently. drive production and increase the availability of iodized salt to consumers. The extensive network of women’s groups played a major role here to keep generating community awareness on salt iodization and iodine deficiency. As the country will move forward with flour fortification, a similar approach involving women could be considered for demand creation and quality monitoring. The Women’s Empowerment in Agriculture Index (WEAI) is a tool that is used to measure the empowerment, agency, and inclusion of women in the agriculture sector. Using a scale from zero to one, a person is identified as empowered if her or his score is 0.80 or higher. In Tajikistan, a baseline assessment was conducted in January 2013 with the help of the United States Government’s Feed the Future Initiative in 12 districts of Khatlon province. The WEAI score was 0.69, meaning that women are considered disempowered in Khatlon province. acceptable diet. 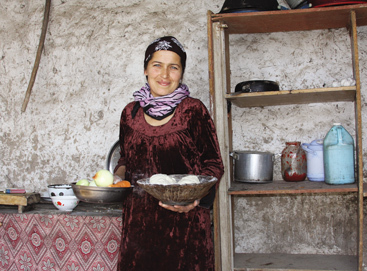 With support from partner programmes like Feed the Future, the Government of Tajikistan is using the WEAI tool to better understand how women are disempowered and what can be done to reverse this. Feed the Future, the U.S. Government’s global hunger and food security initiative, works from farms to markets to tables to improve incomes and nutrition. In Tajikistan, Feed the Future focuses its activities in the southwestern Khatlon Province, a key region for agricultural production that also has some of the highest rates of undernutrition in the country and the largest number of people living below the poverty line. Coordinating with the active and diverse development partner community in Tajikistan, Feed the Future is supporting the Government of Tajikistan’s efforts to implement agricultural, land and water reforms and improve food security and nutrition based on the information generated by the Women’s Empowerment in Agriculture Index (WEAI).In Tajikistan, women play a major role in farming but lack control over resources in the household and within society. Feed the Future is addressing gender issues to support broad-based growth inclusive of both men and women. not only improve household farming but also to generate income from their labor and increase control of their assets. Feed the Future is targeting nutritional behavior change activities toward women and men to ensure improved household nutrition and health. The initiative also considers gender roles in service delivery by identifying and training women facilitators to act as local organizers. All efforts to advance agrarian reform help ensure that women are fully represented and receive and control their share of land and water resources. How does Feed the Future use the the WEAI? As a monitoring indicator to evaluate whether programs are having intended effect on women’s empowerment. As a diagnostic tool to help identify areas in which women and men are disempowered, so that programs and policies can be targeted to those areas. Impact evaluations, testing new indicators/assessing validity in different contexts, etc. Recognize the role of women in agriculture in terms of their control over resources and decision-making, as well as their role in improving nutritional outcomes. Tools such as the Women’s Empowerment in Agriculture Index allows us to understand and quantify the problem, and identify the specific domains of empowerment which are most problematic in the specific country context. This then enables an evidence-based approach in tailoring programming to the specific areas in which it is most needed and most likely to effect change. The process of developing a common results framework provides an important opportunity for gender to be emphasized as one of the main components of a nutrition strategy. As the clock ticks to mark the first hour of the baby’s life, a young mother raises her hand to contradict her mother-inlaw, who wants to give the baby honey instead of breastmilk. It’s one of my favorite TV spots from Alive & Thrive’s (A&T) program in Bangladesh. Every time I view this TV spot, I feel a surge of emotion when the young mother firmly says, “No, give her to me. I have to breastfeed.” This young mother surprised viewers by taking control of her baby’s first hour of life. So it caught me off guard when a participant in the recent SUN Movement Global Gathering questioned the program planners’ decision to portray this young mother standing up to the authority of elders. “Why did you show the mother that way? It’s completely unrealistic. That would never happen,” the participant said. on the participant’s question, but I did take the opportunity to talk about the value of emotional messages that are “aspirational”—that is, that model an action or a situation that our audiences may wish were their reality. 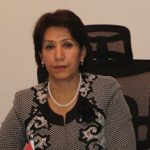 The discussion was enough, though, to trigger a personal response from Mona Girgis, Country Director in Lao PDR for Plan International. Mona had been asked to report to the Global Gathering on the content of the SBCC session. Mona and others in Lao PDR are deeply committed to gender equality and women’s empowerment in their work on nutrition. In its publication “Women’s empowerment for improved community nutrition,” the SUN’s Civil Society Alliance in Lao PDR points out that “there is evidence of a positive association between women’s empowerment and improved nutrition outcomes, and conversely, the disempowerment of women can result in reduced nutritional status for themselves and for their families.” But Mona confessed that she has at times felt discouraged at the gap between the rhetoric and the reality of women’s lives. empowerment, and it is clearly defined in policy, but we are struggling to translate to practice.” Mona wrote to me following the conference. nutrition materials—gave Mona a glimmer of hope. preference for a son. She reports that “surprisingly” there were no raised eyebrows. In fact, in our pretests of the TV spot, mothers had a highly emotional and positive response to the scene where the mother proactively asks for the baby. Mothers also liked the proud father’s praise for his wife. The groups of mothers who saw the spot scored it high for credibility—and opinion leaders did too. A&T’s behavior change activities intentionally targeted grandmothers and other older women, along with fathers, frontline health workers, and community leaders. Our evaluation didn’t measure these groups’ attitudes, but we know that Bangladeshi women of different ages watch TV together. With the shared experience of seeing the image of that empowered young mother, the older women were likely more open to listening to the ideas of the young mothers in their community. And the data for A&T’s Bangladesh evaluation suggest that our strategy worked to increase mothers’ self-efficacy related to breastfeeding. After three years of program implementation, mothers in A&T areas were significantly more confident than their counterparts in comparison areas that they could prevent others from feeding a child aged less than 6 months anything other than breastmilk (73% vs. 47%). In areas where the only A&T intervention was mass media, women who viewed one of our breastfeeding TV spots were 48% more likely to initiate breastfeeding within an hour of birth, compared with those who had not viewed one of the spots. Let’s all take hope, then, in the power of emotive messaging that can model a better world. Our communication materials may be explicitly addressing improved child feeding practices. But these same messages and materials can subtly, almost subliminally, introduce changes in gender roles and power as we move from rhetoric to action.